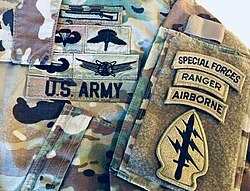 Military badges of the United States are awards authorized by the United States Armed Forces that signify rating, qualification, or accomplishment in several career fields, and also serve as identification devices for personnel occupying certain assignments. Personal recognition is granted to service members by a number of awards and decorations. Together with military decorations, such badges are authorized for wear on military uniforms. Each of the five military services maintains a separate series of badges that may be awarded to service members. Various regulations exist on how badges are displayed, how many may be worn at one time, and whether such badges may be worn on the uniform of more than one branch of service. In addition to those badges currently authorized, there are a number of obsolete badges that have been phased out of the U.S. armed forces and no longer appear on U.S. award precedence charts. This page was last edited on 15 April 2018, at 13:35 (UTC).